All proceeds go to needs for long term patients in the facility. If you wish to donate items or help with the event. 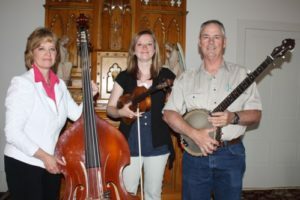 Joan and Tom Eliel, known for their blend of country music and traditional gospel songs, will throw in some lively Irish music Saturday at Townsend’s annual Leprechaun Festival. The 11 a.m. – 1 p.m. program in the Elementary School lunchroom includes luncheon and a silent auction. Admission is $10 and $5 for children aged 5-12. “We always enjoy playing for the Festival and we’re looking forward to having some surprise musicians too,” Joan says. Tom and Joan came to Townsend from Dillon in 2001. Joan was raised on a ranch at Alder and Tom ranched near Wisdom. Joan sings and plays the base fiddle while Tom sings and plays most other stringed instruments – ukulele, mandolin, banjo and guitar. They and their children Jenna and Brad played with the Dillon Junior Fiddlers group when the family lived in Dillon. The Junior Fiddlers entertained at Townsend’s Rodeo Barbeque last August. Tom flies for Corporate Airlines, a Federal Express feeder, and Joan works for the state Department of Justice in Helena. Silent auction items include three coolers of frozen Alaska salmon, halibut and cod, $50 gift card to the Silos KOA, $125 free ads in the Broadwater Reporter, movie passes and grocery gift cards, according to Jena Smith, silent auction organizer. Raffle tickets for a stay of two nights at Fairmont Hotsprings will be on sale at the luncheon. The Leprechaun Festival is sponsored by the Broadwater Health Center Auxiliary. Money raised goes primarily for meeting needs of the center’s long-term patients, most of whom need skilled nursing care. Last year the Auxiliary purchased a custom-built wheel chair, signage for the halls and helped refurbish patient rooms.